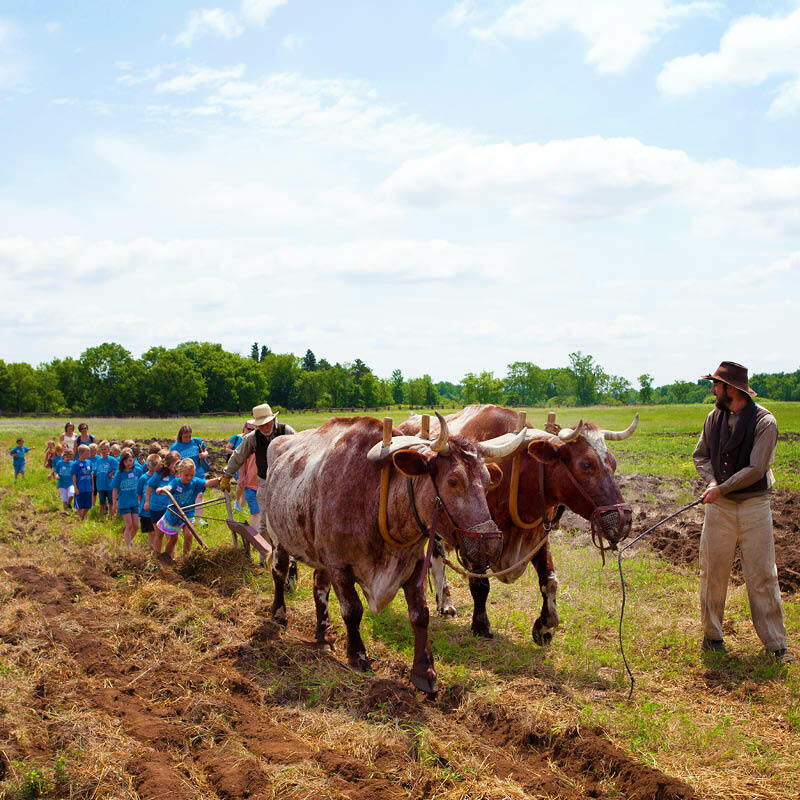 Be immersed in the world of 1860s farming, when agriculture in Minnesota looked very different than it does today. 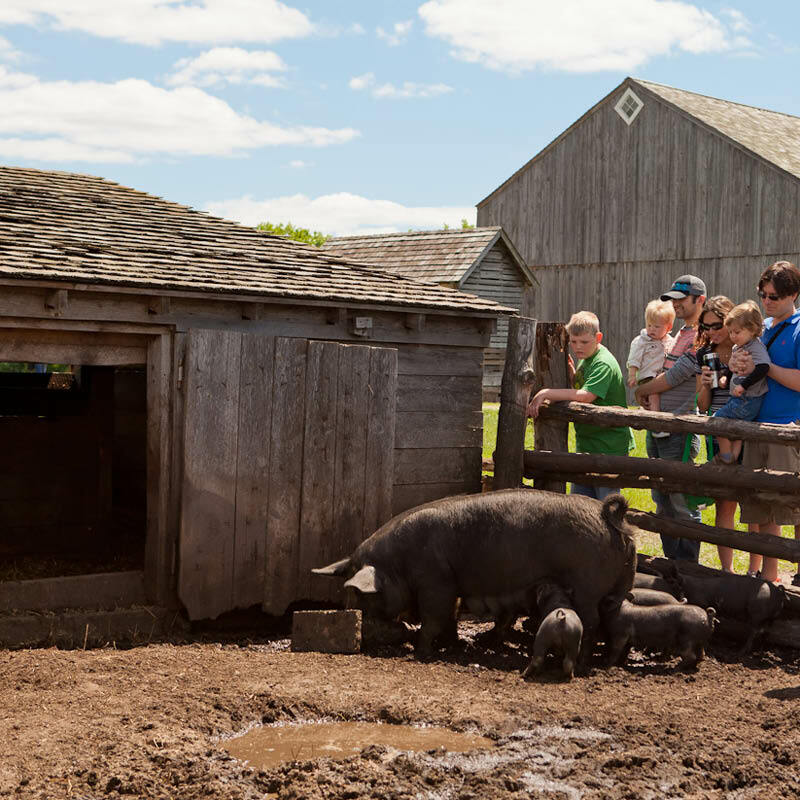 Your whole family can meet farm animals, interact with costumed staff as they work in the house, barn, garden, and fields, and participate in a wide variety of activities that follow the farming cycle and change with the season. 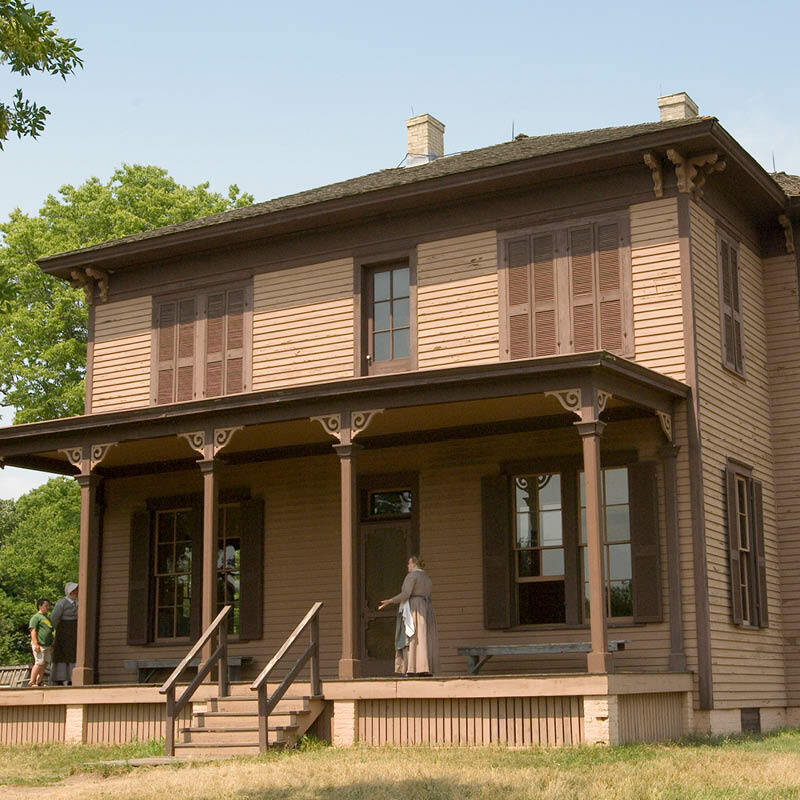 Go inside this large Italianate-style house and help with household chores, from sewing to preparing a 19th century meal. This is the second Kelley home, built in 1876 on the foundations of the first house and completed after the Kelleys sold the farm. Head downstairs to the basement and you’ll find yourself in the oldest structure on the farm. Can you spot the original 1850 rock walls? The root cellar is a cool, dark storage place for food. 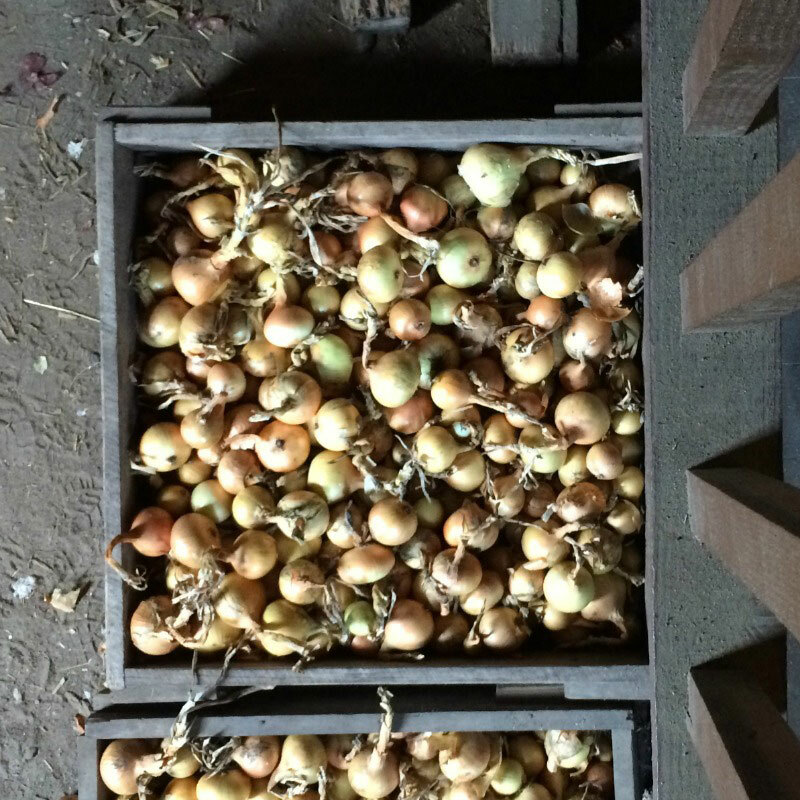 As produce comes in from the garden, this room fills up in preparation for winter. 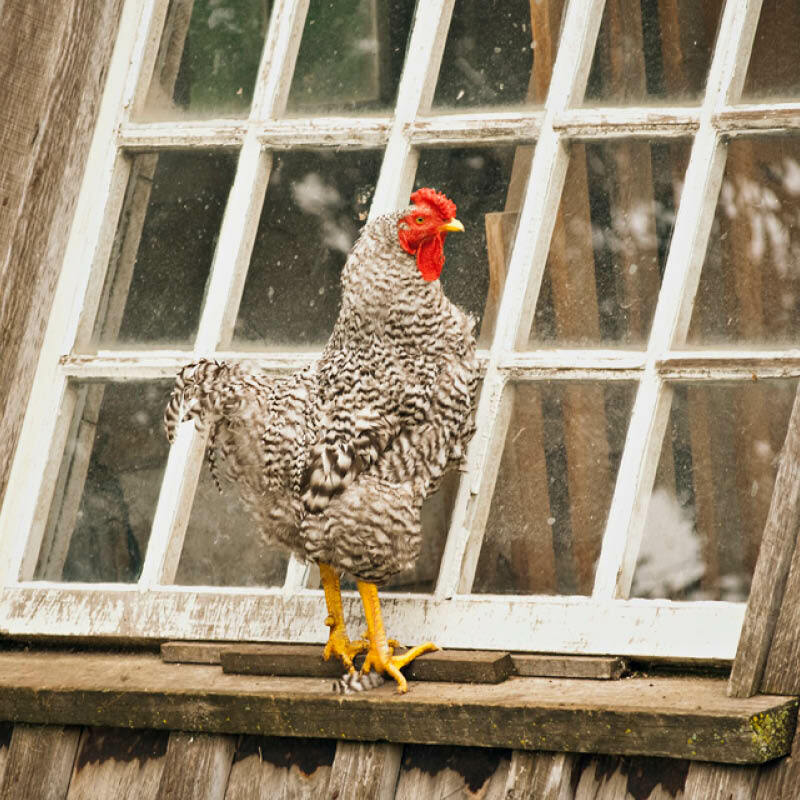 Discover rare breeds of 19th-century chickens such as Dominiques and Dorkings. Listen carefully and you might hear a rooster crowing during your visit! 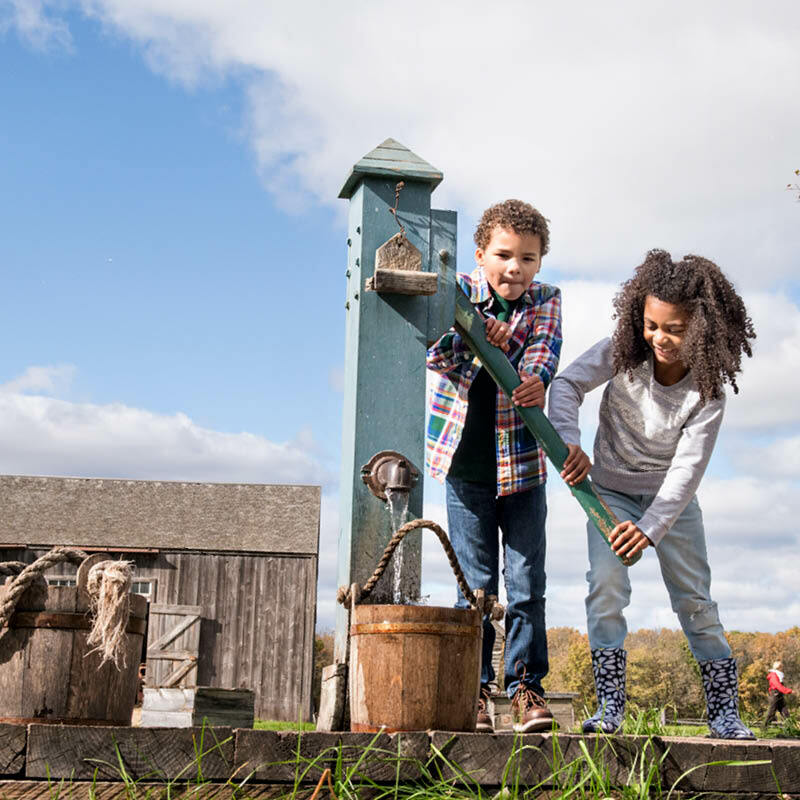 Try your hand at pumping water and hauling it to wherever it’s needed on the farm. Located in the center of the farmyard, the pump serves both the house and barn. Kelley told of digging two wells on his farm in the 1850s while many farm families still collected water from rivers and streams. 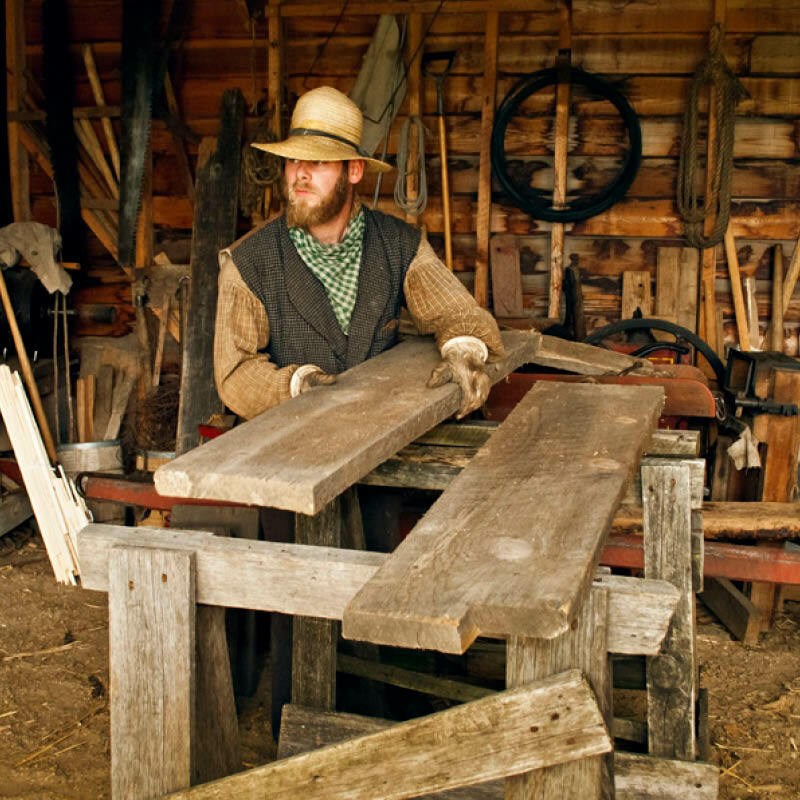 Find many types of farm tools and equipment. See if you can figure out how they are used! 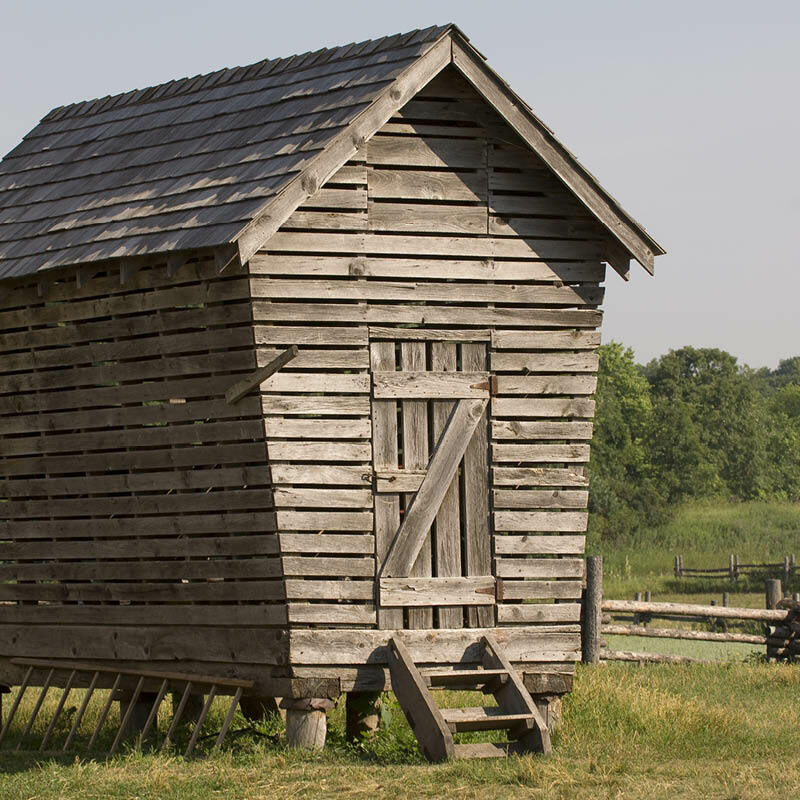 This shed was copied from a shed built near Monticello, MN, on another 1860s farm. Explore upstairs in the barn to find the grain and hay that will feed animals year-round, then check out downstairs to see where the cattle and horses eat. When Kelley built this barn, it was the first frame barn north of the Twin Cities. This historically accurate reconstruction was built in 1974. 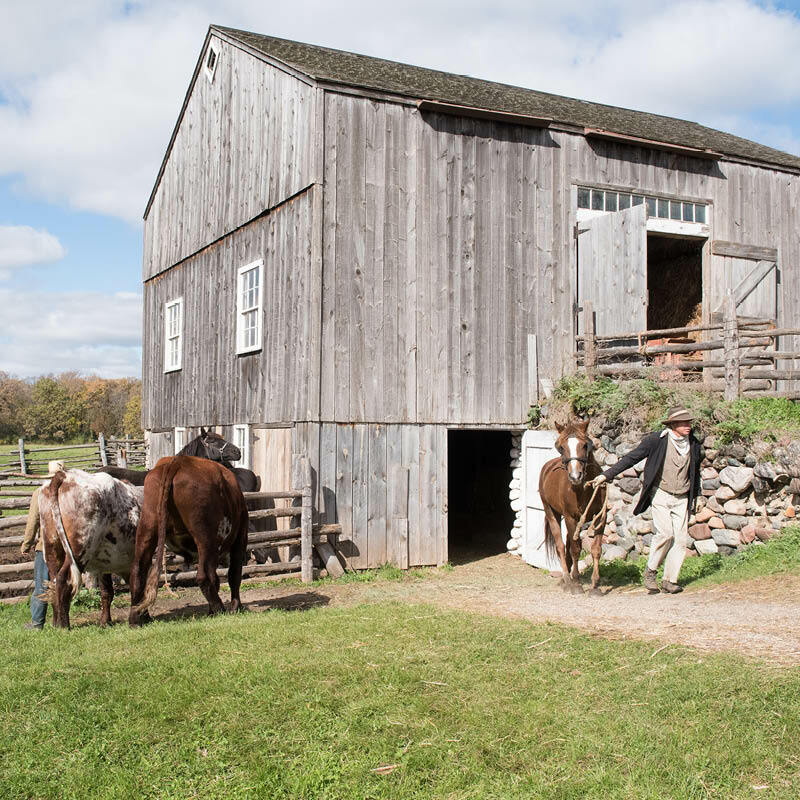 Outside the barn you might see draft horses and cattle, including oxen, in the cattle yard. In these plan-book sheds and pens you’ll find Berkshire hogs and Southdown sheep, both common 19th-century breeds. Participate in the animal care chores that families like the Kelleys did every day. During the fall and winter dried ear corn is stored here and fed to animals. By mid-summer it is usually empty, awaiting another year's harvest. The 19th century corn grown here is different from the corn most farmers grow today — can you tell how? Explore the fields to see many of the same plants the Kelleys grew. Plantings rotate between oats, wheat, hay, corn, and sorghum. Like in Kelley’s day, human and animal power are used to plow, plant, harvest, and bring in crops. If you come on a day when there’s fieldwork to be done, be ready to work!